Animal Clinic of Woodruff is equipped to provide diagnostic and therapeutic services to care for your pet's immediate and long-term health. Our diagnostic services pinpoint why your pet is sick, what the disease or illness may be, and how best to treat it. To make the right diagnosis, we’ll talk with you about your pet’s behavior, symptoms, problems, and overall health. We’ll then perform a thorough exam and any necessary lab work to learn the cause of the illness or condition. Our diagnostic services and in-house laboratory can help detect pet diabetes, animal cancer, pet pregnancy, bacterial or viral diseases (such as parvo, distemper, or kennel cough), pet arthritis, food allergies, heartworm, kidney disease, liver disease, and more. In order to provide immediate diagnoses while you are at the clinic, we utilize both in-house and outside laboratory services. Animal Clinic of Woodruff has an in-house, state-of-the-art Abaxis laboratory. Abaxis’s equipment is cutting-edge, top-of-the-line medical technology for veterinary care. You can enjoy peace of mind knowing that your pet is being treated quickly, safely, and with the best veterinary equipment available. 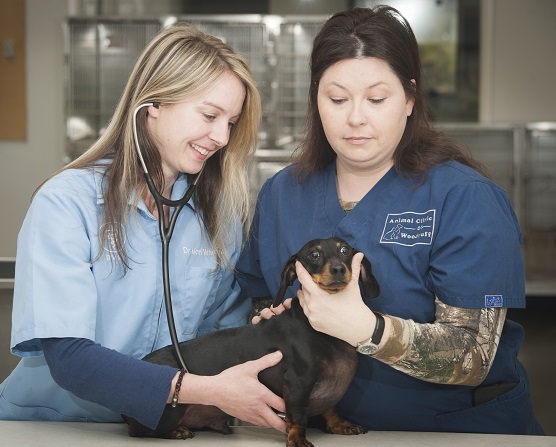 For more complex diagnostics, our veterinarians may send lab work to the following outside laboratories: Idexx, Avid, Antech, Clemson University’s Veterinary Diagnostics Center, Minnesota University Lab, and VARL Liquid Gold allergy testing. If you are concerned about your pet’s health, please call us and make an appointment with our veterinarian today.